The only cover is the stand, which costs an additional ?1 to sit in. The rest of the ground is grass banking with hoardings surrounding it. The pitch was in a reasonable conditions, but can be a bit heavy, and there are floodlights. Litterbins are a bit scarce and the grass banking can be slippery in wet conditions. On the day we visited, our reviewer saw a man take a ball very hard in the face standing next to one of the goals, the spectators are very close to the action! We have been assured by Steven, the Forres Machanic Webmaster, that this is not a regular occurrence. There is also a club shop, that is open on match days. There is plenty of car parking on the rough ground outside the ground. 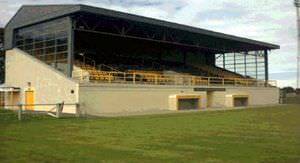 There is enough to cope with the level of support we have but just in case, Forres is totally free to park in, and everything is five minutes from the ground. Facilities for disabled supporters are a little bit sparse. Motorised vehicles are parked next to the dugouts, and therefore have an excellent view. We do have one fan with MS who gets a carry up and down the stairs by his mates. He rarely misses a game home/away, and always sits with his pals. If you are a registered user then you can login, and create your own personal review of Forres Mechanics - Mosset Park. These reviews can be private or public.